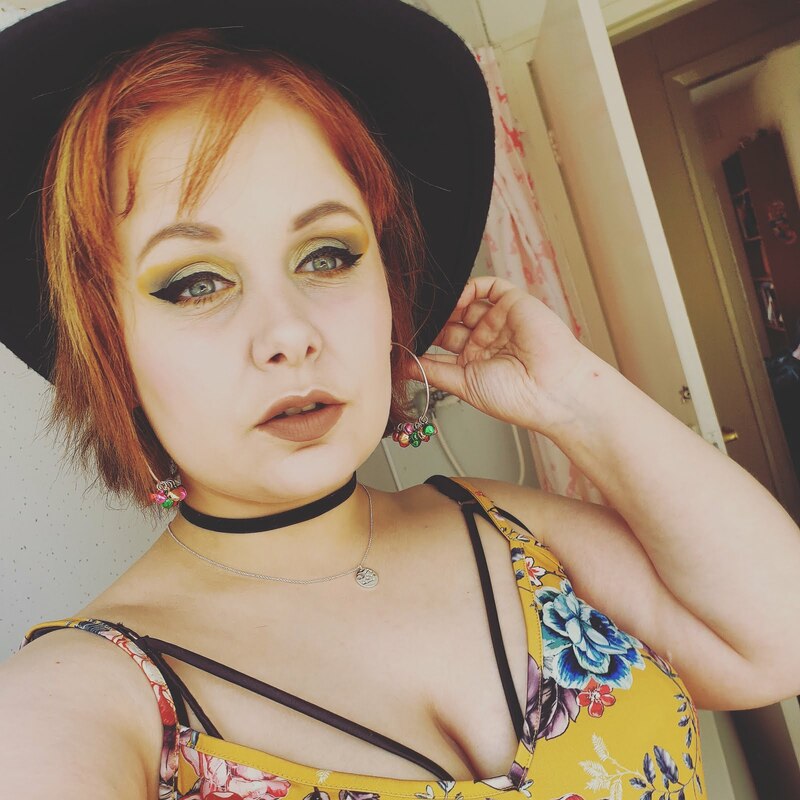 I hope everyone is having a fabulous week so far! Is it me or is it blooming cold this week? I am so glad I found some warm cuddly coats in the charity shop today because I needed a warmer winter coat because it's not even winter yet and it's too cold so I am sure the coming months will be colder. Anyways less complaining let us have some positive talk. 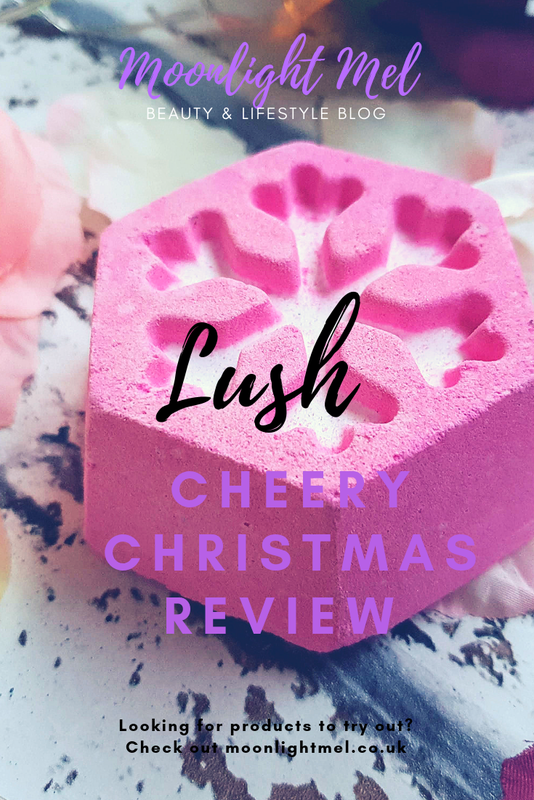 Lush has an amazing collection of Christmas products this year don't you agree? I have only tried 2 products so far but I can't wait to try out more of their products before the new year. I am secretly getting excited about the boxing day sale but wish they did the online sale! Cheery Christmas is a new product in the 2018 range! The design is lovely and is new this year! 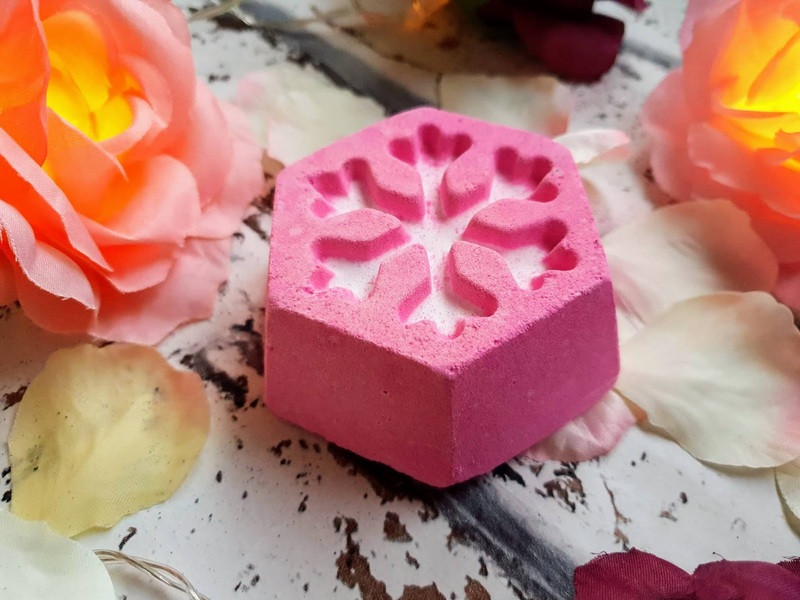 Its bright pink hexagon shape with a beautiful snowflake design in the centre, I just love it. Now its said that this is a citrus bath bomb with its ingredients but personally I didn't feel like it was, it was more fruity/spicy. The main fragrances in Cheery Christmas are 'Buchu oil' and 'Sicilian lemon oil'. 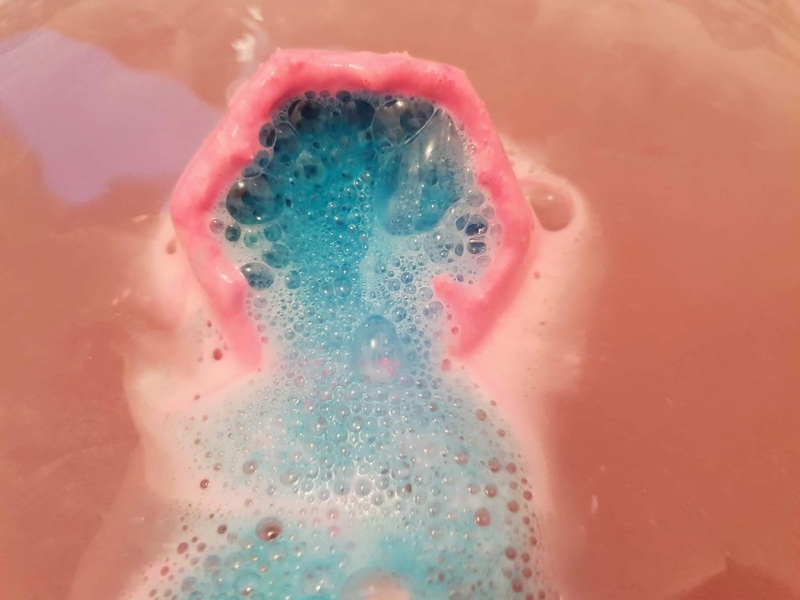 I put this in my warm full bath and as soon as it hit the water it started fizzing and foaming away for a few moments until the snowflake dissolved revealing a blue centre inside the bath bomb. It was fizzing away in the bath for a few minutes before it melted completely. Even though the bath bomb itself is pink, white and blue.. it didn't turn out the way I thought it would. I was kind of expecting a nice vibrant purple but for me personally, it looked pretty dull which is a shame really since it looks like a nice bath bomb. The smell was a bit on the fence of me. It is meant to have a blackcurrant scent with a twist of citrus with the Sicilian lemon oil. 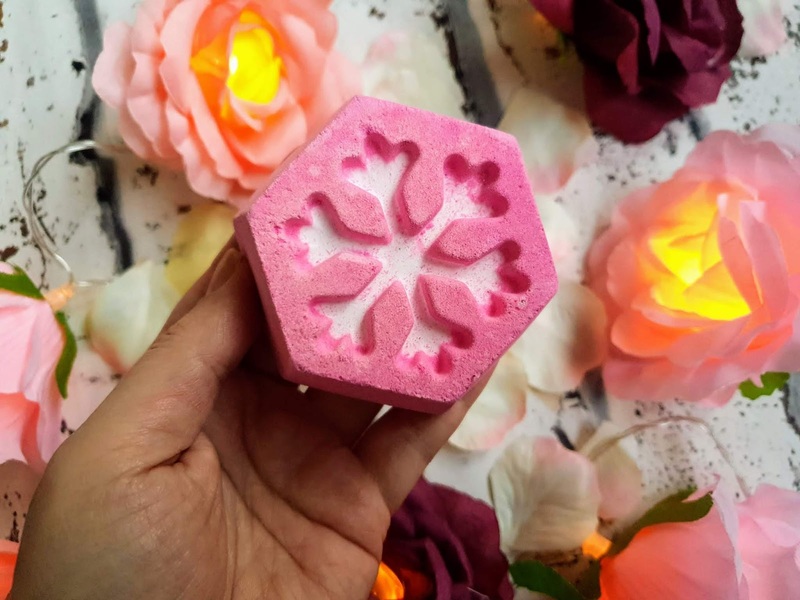 I really didn't know what to think of this because its a new combination from lush but for me, it didn't pack enough punch for me and could have done with more citrus fragrance as it wasn't enough in my opinion to wow me over. It did get better from their though because it made the bath water feel very silky and felt lovely on the skin. It was very moisturizing on the skin and made applying moisturiser after the bath a breeze. Overall its an OK bath bomb but it isn't a bath bomb that's going to have me running back to lush to buy again because it didn't win me over which is a shame. 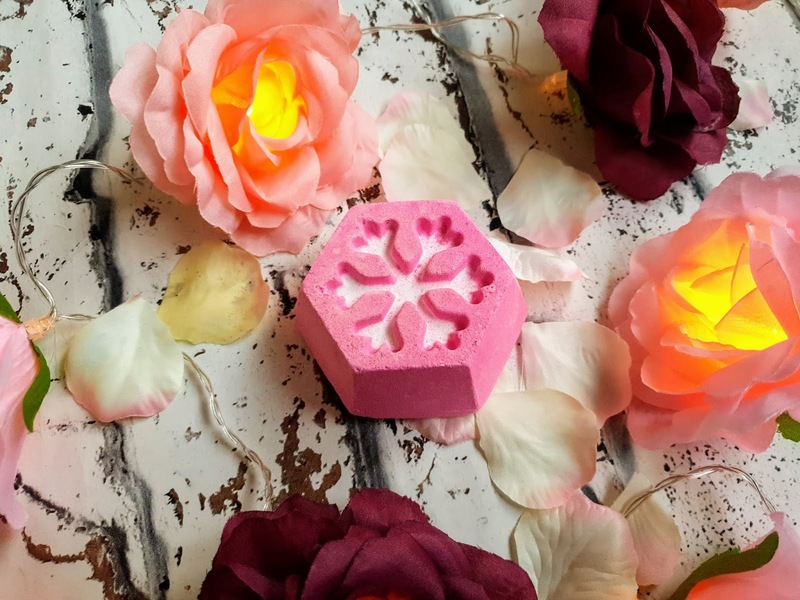 I do love the design and the smell is ok and the bath water felt lovely too but it just wasn't a fragrance I liked and the bath didn't look good too as you would expect when you are buying a single-use product that costs £3.95. Even though I wasn't 100% with this bath bomb I am still excited to try more of the Christmas Collection. I really want to get 'Marshmellow World' and 'Santa Bomb Bomb'. Have you tried anything in the Lush Christmas Collection yet? Oh gosh yes, I have been freezing this past week! And I need a new winter coat too. Shame it didn't quite work out for you. When I use a bath bomb I want it to be BRIGHT haha.